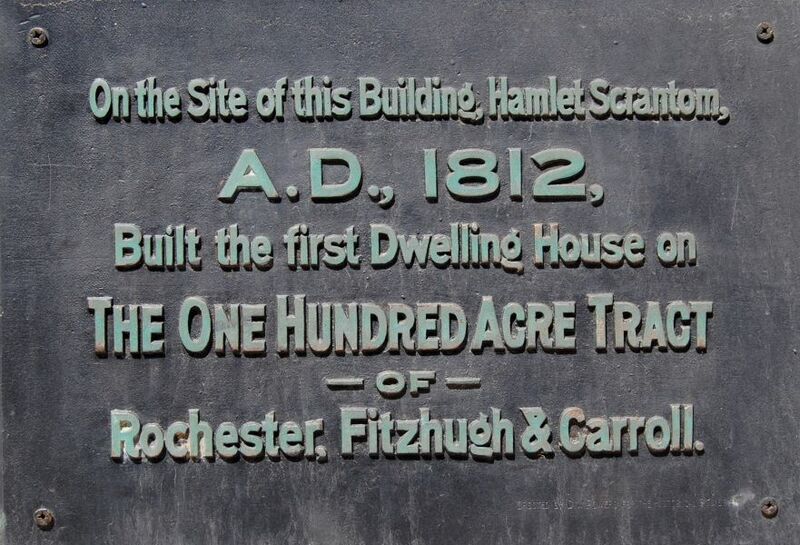 Rochester's One Hundred Acre Plot was deeded to Ebenezer Allen in 1789 by Phelps and Gorham as compensation for constructing a sawmill and a gristmill on the west side of the Genesee River. This plot was purchased by Nathaniel Rochester, Charles Carroll and William Fitzhugh in 1803. The plot was surveyed in 1811 and active selling begun in the fall of that year. 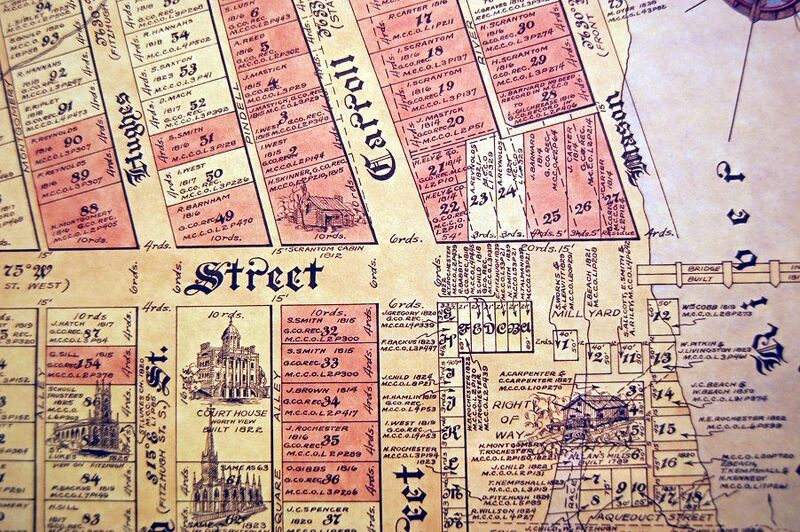 "Two broad streets were staked out, each six rods wide. One of these, appropriately named Buffalo Street, extended westward from the bridge, while the other ran north and south, crossing the other at a main four corners a short distance from the bridge. Quarter acre lots on these business streets were offered at $50 each, except for the choice northwest lot at the Four Corners which was priced at $200. 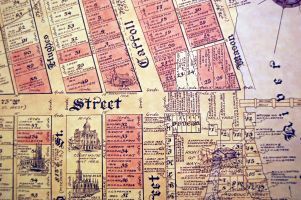 Several additional streets, each four rods in width, were laid out and $30 asked for lots on these back streets." A map from 1934 shows the Four Corners. Note the width of the streets are 6 rods and 4 rods. A rod is 5 ½ yards so the widths of the streets were 99 feet and 66 feet respectively. An acre is 4840 sq. yd. so a quarter acre lot would be about 100 ft. x 100 ft. Note the cabin on the Skinner property on the northwest lot at the Four Corners. 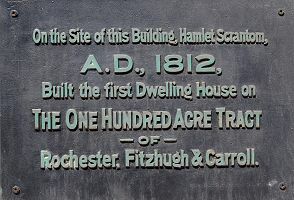 In March, 1812 the miller, Hamlet Scrantom visited the falls and bought a house lot and arranged to move into a cabin already under construction. When he and his family arrived on May 1st the cabin had no roof but it was finally completed and the family moved in by July 4th. 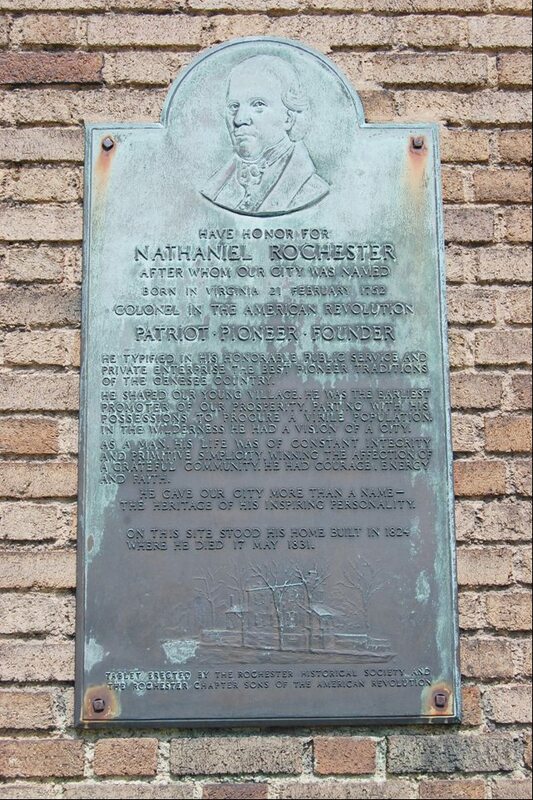 They were the first permanent settlers in the first building constructed in what was to become the city of Rochester. The event is commemorated by a plaque on the Main Street side of the Powers Building. Our tour will start at the Four Corners and will include the history of existing buildings and some which no longer exist. As just mentioned the first building on the key northwest corner was a log cabin. The lot, sold to Henry Skinner for $200 in 1811, was sold to Dr. Azel Ensworth in 1817 for $12,000. Dr. Ensworth moved the log cabin to the back of the lot and used it as a stable for the larger wooden building, the Ensworth Tavern, on the corner. He eventually added an attic which was used as a concert-room, ball-room, lecture-room and theater. In 1829 the building was torn down, and on its site A. M. Schermerhorn erected a brick edifice known for forty years all over the state as the Eagle Hotel. The Eagle had a good reputation and in 1851 Daniel Webster and Jenny Lind stayed there while in Rochester. The following picture of the Eagle Hotel is circa 1850. The property was acquired by Daniel Powers in 1863. 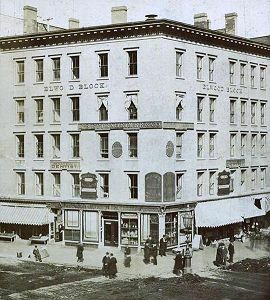 In 1865 he began construction of his Powers Block at 37 & 39 State Street which had been the site of Case and Mann's Dry Goods store. This section is faced with iron cast to look like stone. 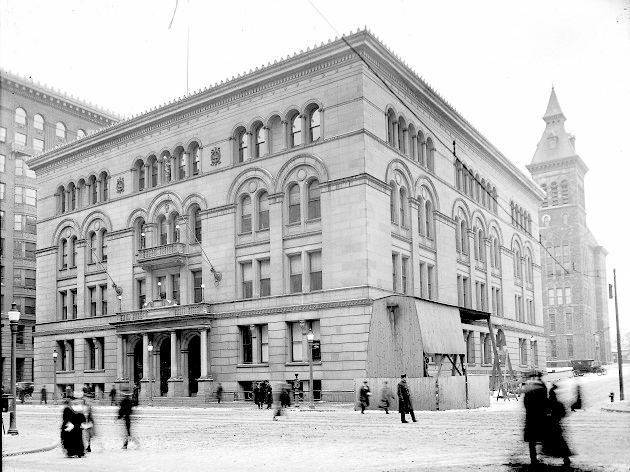 Principal excavations began in 1868 and the building was completed in November 1870. The corner section looks very much like the Eagle Hotel it replaced. This may be explained by the following from Blake McKelvey in Rochester History Vol. 31 October, 1969 page 14 although there is some contradictory evidence. "Daniel Powers remodeled it as an office building by constructing his Powers Block as a cast iron shell around the old brick structure gradually replacing its interior with new floors and walls without discontinuing the banking and other office functions." A book, Powers' Commercial Fire-Proof Buildings , was published in 1871 and much of the above information is from that book. It states that the ground floor contained one bank and fifteen stores. The upper stories contain 160 rooms which are used for almost every conceivable kind of business and occupation. The D.W. Powers Banking House entrance was at the corner of State and Buffalo Streets. This was the location of the Bank of Monroe from 1832 to 1850 at which time it was taken over by Mr. Powers. 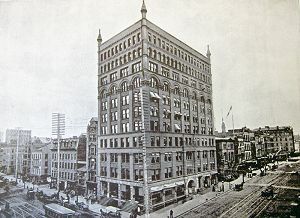 The buildings architect, Andrew J. Warner, had a suite of three rooms on the second floor of the completed Powers Building. 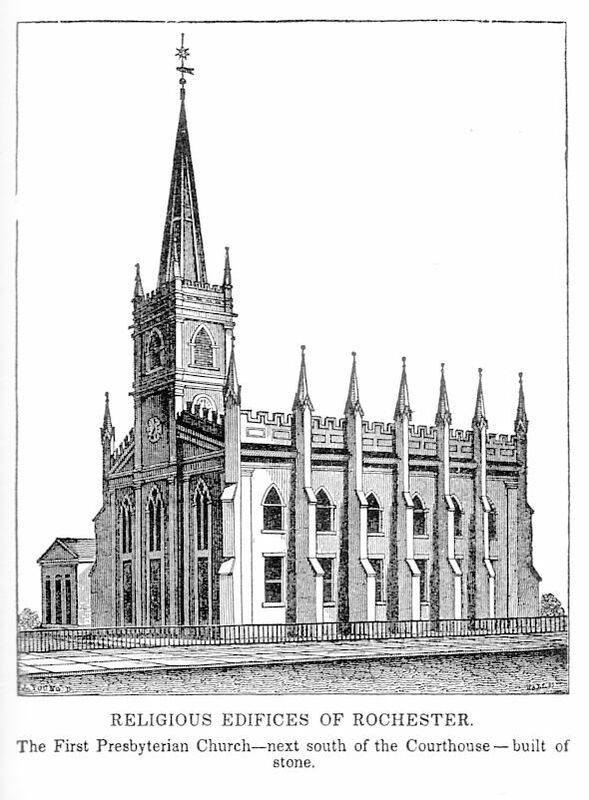 The following illustration of the completed building is the frontispiece of the book. Compare this with the picture of the Eagle Hotel. 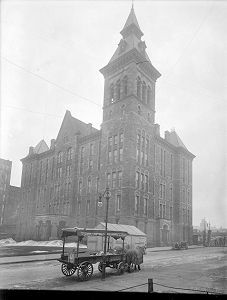 The following link to the Powers Building website covers the buildings history and Powers' attempts to keep it the tallest in Rochester. The development of elevators and improved building techniques led to the building of "skyscrapers" two of which competed with the Powers Building to be the tallest building at Four Corners and in the city. These buildings were the Elwood Building on the NE corner and the Wilder Building on the SE corner. The original structure on the NE corner was a stone business block built in 1818. 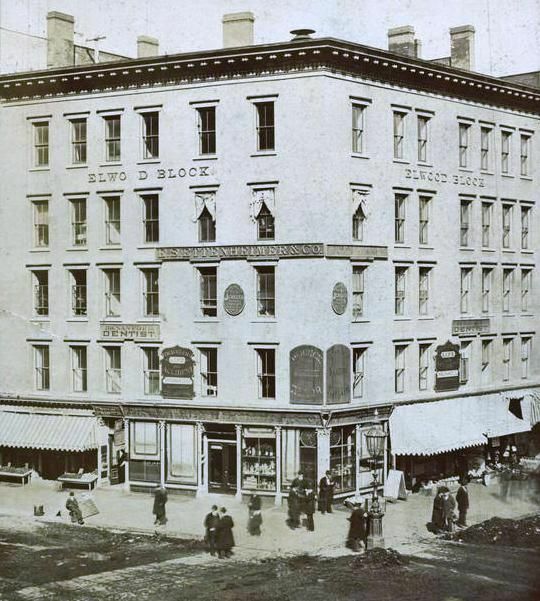 It was called the Burns Block until purchased by the Elwood Family in 1864. 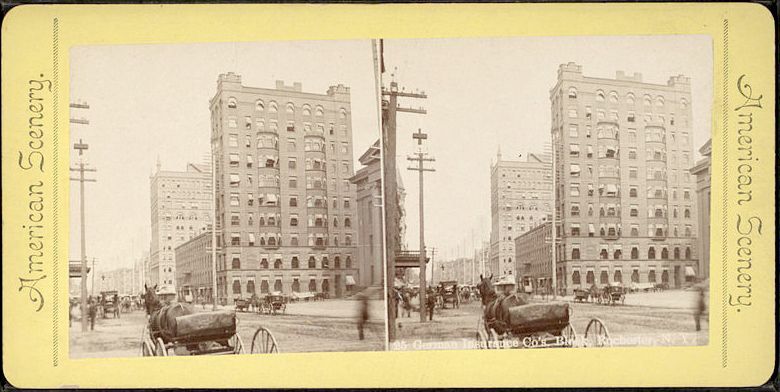 This building was razed in 1879 to make way for the Elwood Building. 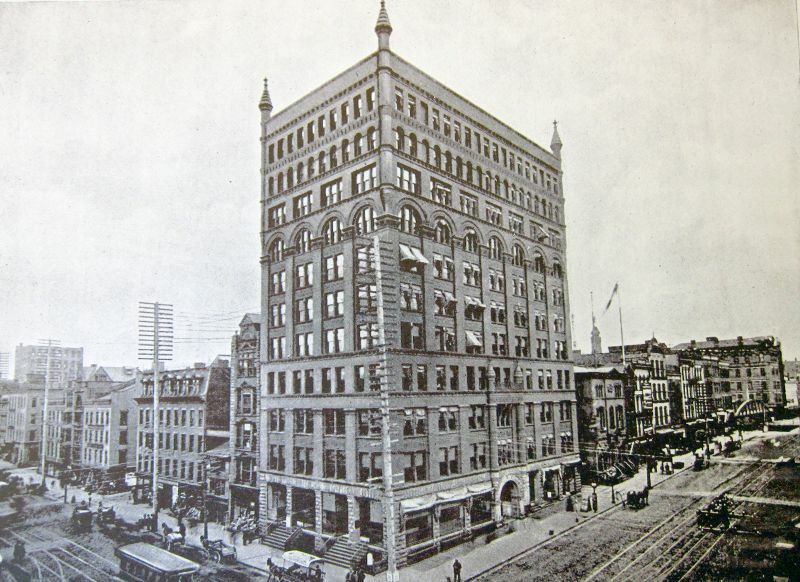 This new building, designed by James G. Cutler, was seven stories high and had a Gothic clock tower. 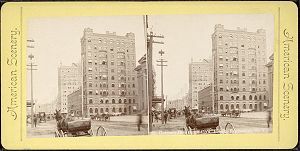 In this picture the Powers Building is on the left and the Elwood building in the left center. To the right of the Elwood Building is the Reynolds Arcade and further to the right notice the buildings that line the Main Street Bridge. How many street-cars do you see? The building on the far right is the 12 story Granite Building on the NE corner of East Main and St. Paul. 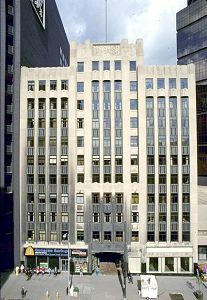 The Wilder Building is considered Rochester's first "skyscraper". 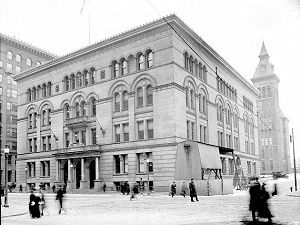 It was erected in 1877-78 by the prominent banker and real estate developer Samuel Wilder. A.J. Warner and James G. Cutler contributed to the project. The building, in the Romanesque style, is iron frame construction faced with brick. The spires at the corners have been removed. Notice the number of wires on the poles. Cutler's important contribution was a mail chute which he also included in the Elwood Building. For information on the mail chute see http://en.wikipedia.org/wiki/Mail_chute. This helped solve the problem of mail collection in "skyscrapers". It should be mentioned that prior to this time the Four Corners was a retail area. Today, as then, retail is most successful at street level. The development of these tall buildings brought legal and business offices to the area. 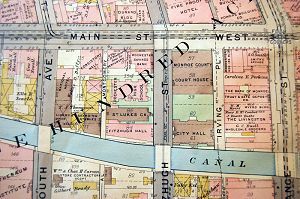 Two buildings between the Four Corners and the Main Street Bridge, the Reynolds Arcade and the Talman Building, deserve mention. Abelard Reynolds purchased two lots near the bridge in 1812. He brought his family from Pittsfield, MA to the 100 Acre Plot in February 1813 and became the first person to complete a frame house. He ran a saddlery and the first tavern on the west bank on the site and with the help of Colonel Rochester became the settlements first postmaster, a position he held for nearly 17 years. 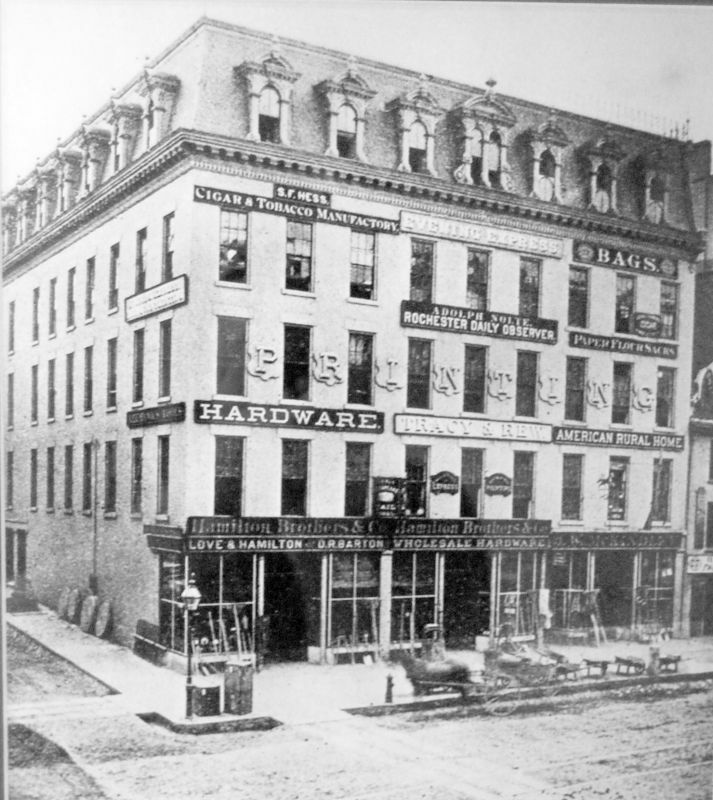 In 1828, backed by capital from Albany and New York City, he moved the house 150 feet to the rear of the plot and built the 4 ½ story Reynolds Arcade. 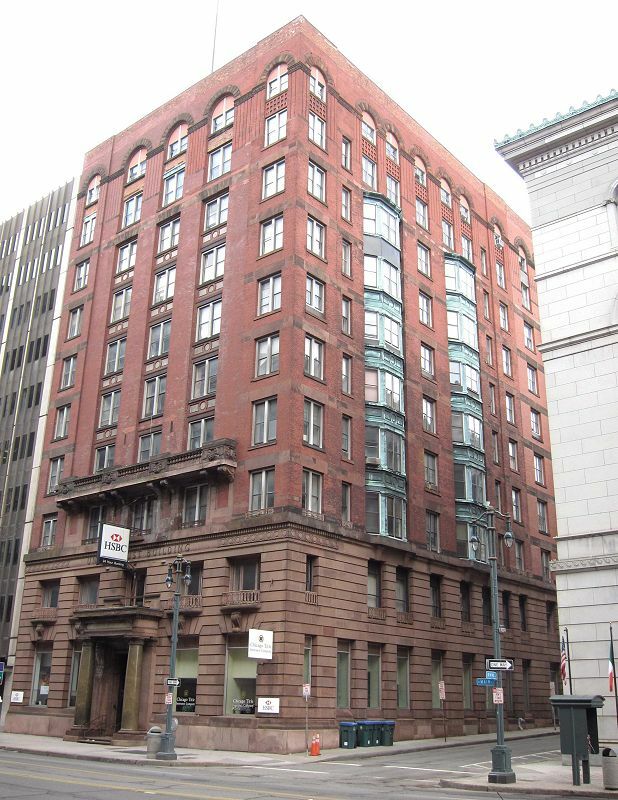 It was built of brick, fronted 99 feet on Buffalo Street and had 86 rooms. The building was divided through the middle by a lofty skylighted corridor. Shops and offices were on the ground floor and a second balconied gallery level. The post office was at the rear of the hall. 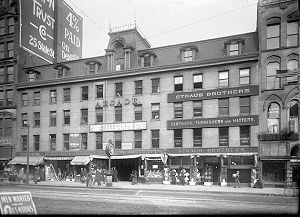 It had six large stores facing Buffalo Street, hotel rooms on the upper floors and on the roof an observatory 89 feet above the street. It was remodeled in the 1880's and rebuilt in the Art Deco style in 1933. 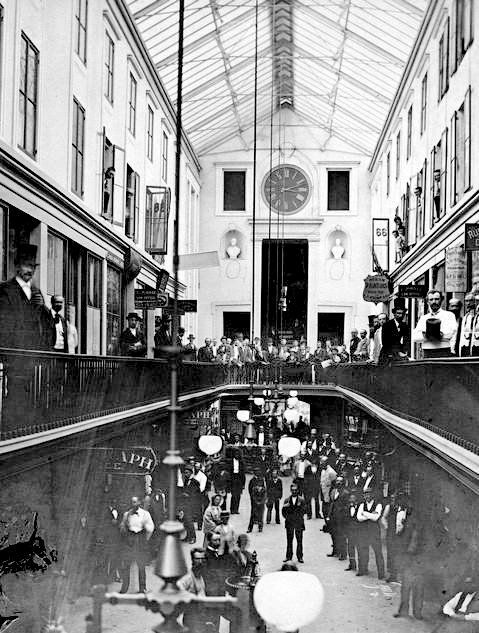 See also: The Reynolds Arcade. Across the street from the Reynolds Arcade is the Talman Building. This building was the site of Frederick Douglass' newspaper office. 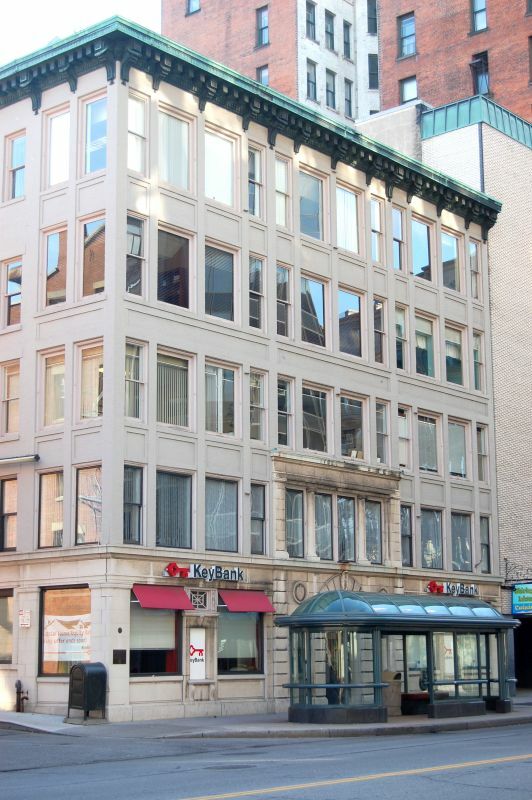 An 1859 account says his office was a single room on the second floor of the Talman Building. 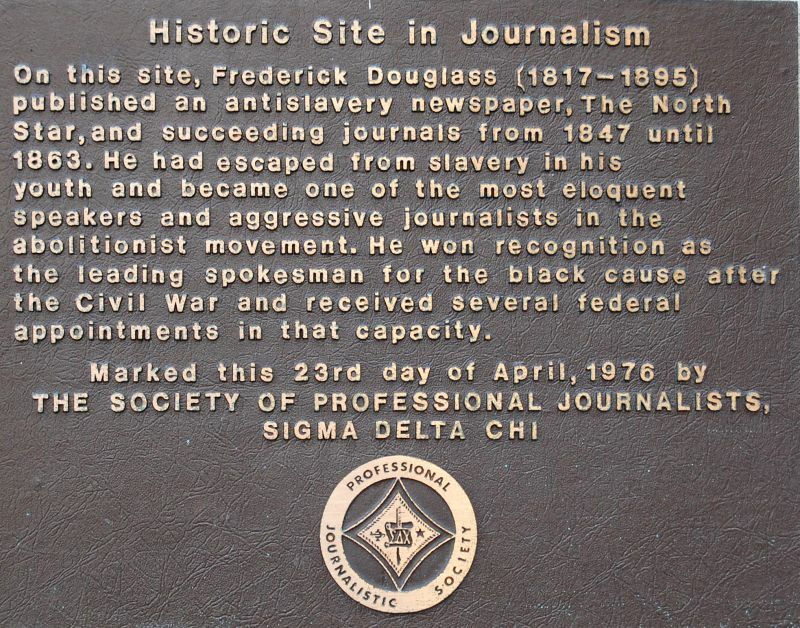 The newspaper was variously titled The North Star, Frederick Douglass' Paper and Douglass' Monthly. 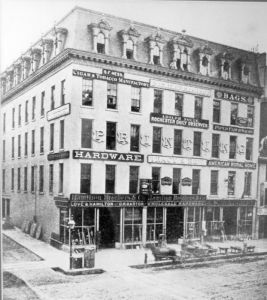 An 1860's picture shows the building with a mansard roof. 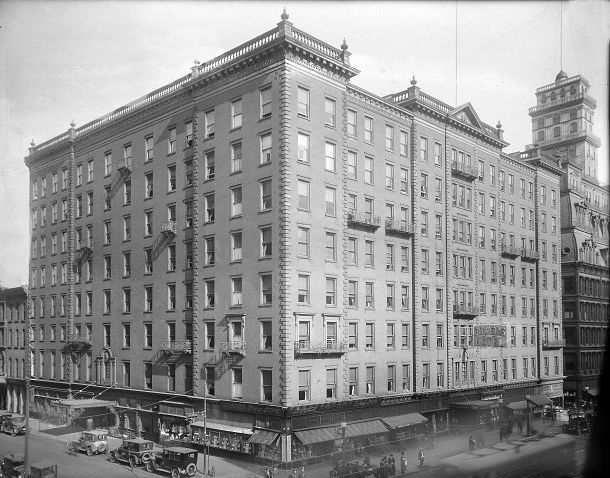 The building was updated circa 1915. 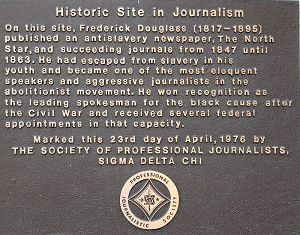 In 1980 a document was found indicating Douglass was born in 1818. The following picture shows Main Street looking west from Four Corners in 1906. 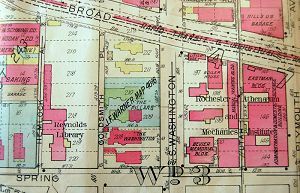 The building in the center is the Rochester Trust and Safe Deposit Company on the SW corner of the Four Corners. It is follower by the German Insurance Company, the Monroe County Office Building and the Rochester Savings Bank which was on the SW corner of Main and Fitzhugh. Information on the Rochester Trust and Safe Deposit Company can be found here. The German Insurance Company was founded it 1873. 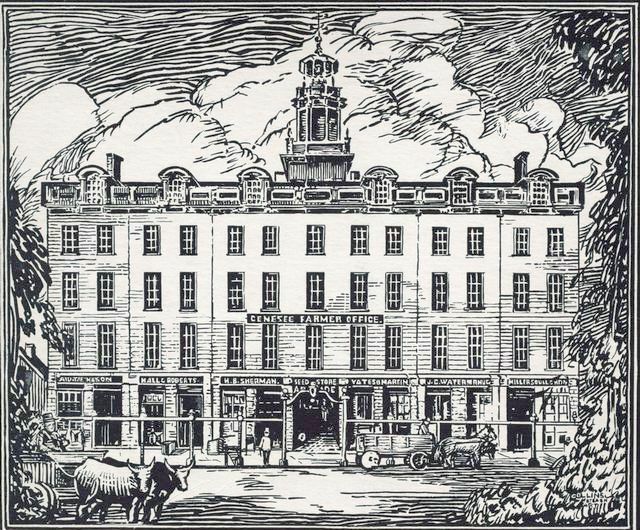 This company organized in 1872 was the first local company to issue fire insurance. It was very successful and spread across the country. In 1888 it opened the 10 story German Insurance Company building it constructed on the SE corner of West Main Street and Irving Place. It survived claims from the San Francisco earthquake but in 1911 merged with the German-American Insurance Company of New York. A New York Times report has some information. In 1925 the Union Trust Company moved into the building and that is the name now over the door. The front of the first two stories is Carlisle stone from Springfield, MA. The upper stories are pressed brick with profuse stone trimmings. The bay windows are set in raw copper. 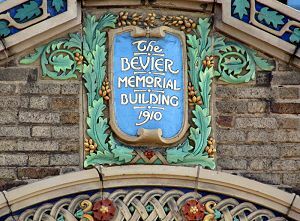 The outside is richly ornamented. 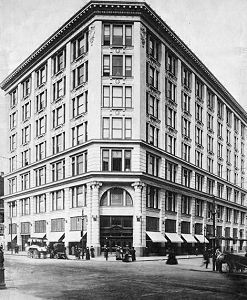 When opened the German-American Bank occupied the first floor, the German Insurance Company the second and the Rochester Title Insurance Company the basement. There were about fifty offices above the second floor. The architect was A.J. Warner. 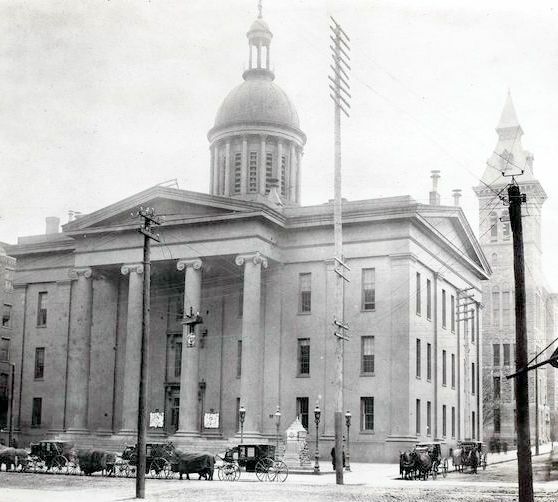 In 1888 the second Monroe County court house was next door and much smaller than the current building. There was a square between the buildings. This is shown in a stereoview. Observe the distance between the building and the court house on the right edge of the picture. A current picture looking east on West Main Street follows. Note the bay windows on the Irving Place side. Look at the pictures of the current German Insurance Company and the stereoview. How many windows wide is the building. In the current picture five and in the stereoview three. 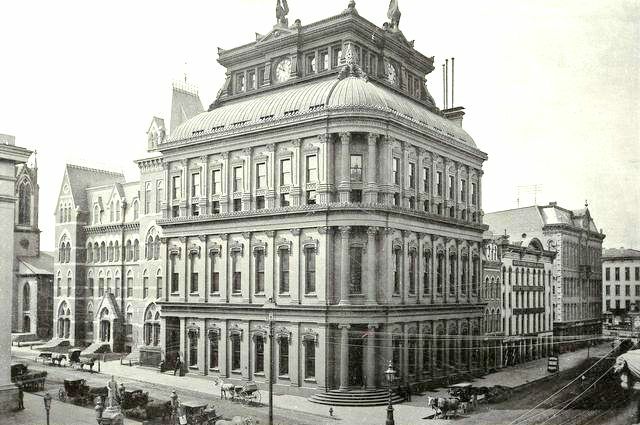 Look at the earlier picture of the Rochester Trust and Safe Deposit Company. The German insurance Company is five windows wide. 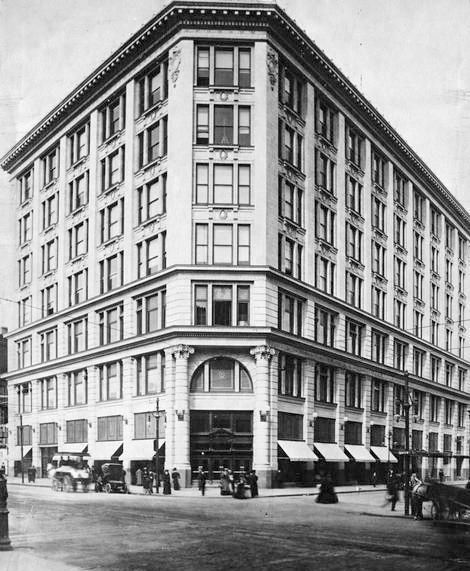 Between 1903 and 1906 Smith's Arcade was demolished and Rochester Trust built. It's likely the German Insurance Company was widened at the same time. When Monroe County was formed in 1821 a question rose as where to locate the court house. Colonel Rochester and his partners had reserved a space for a court house in their 100 acre plot but also did the Brown Brothers in their 200 acre plot at the high falls and Elisha Johnson in his 80 acre plot on the east side of the river. The Rochester site was selected because of its more central location. 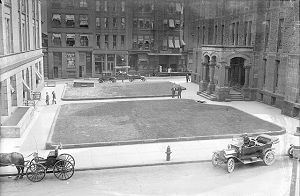 The Brown Brothers plot is now Brown Square located between the baseball and soccer stadiums and Johnson's plot is now Washington Square Park. The following is a sketch of Court House Square made in 1827 by British Army Captain Basil Hall. The spire to the left of the courthouse is the First Presbyterian Church while that to the right rear is St. Luke's. 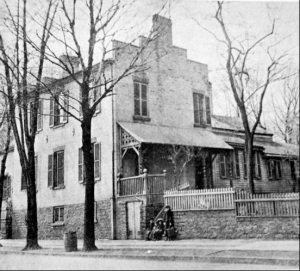 A photograph of the first Court House can be found at http://www.monroecounty.gov/history-cob.php. 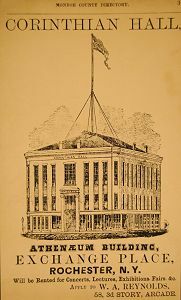 The first court house was in use from 1822 - 1849; the second from 1850 - 1893; and the third from 1893 to the present although it is now the Monroe County Office Building. For many years the city and county shared space in the court houses. The third County Courthouse built during 1894 - 1896 is now the Monroe County Office Building. It was designed in the Italian Renaissance style by J. Foster Warner. It has a granite exterior featuring round-arched windows and heavy hooded moldings. The front niche contains the statue of "Justice" which was originally atop the dome of the second court house. Be sure to stop in and see the sky lit central atrium. On the north corners of Main and Fitzhugh are the former Duffy-Powers store ( NW) and the Power's Hotel (NE). The Rochester Savings Bank Stood on the SW corner of Main and Fitzhugh. This three story building was build between 1853 and 1857. The building was redone and an extra story added between 1875 and 1877. Additional information here. We will turn left (south) at Fitzhugh Street. 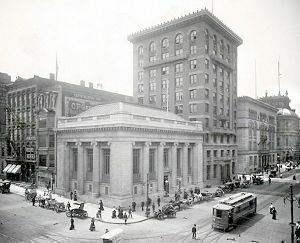 Note the buildings to the left of the bank in the above picture. The first is the Rochester Free Academy and the second St. Luke's Church. Before proceeding left also notice the statue in the lower left of the picture. It is part of the Cogswell Fountain. The base is seen in the picture of the Second Monroe County Court House. We should also look at a map before proceeding. The map shows the area in 1900. The Four Corners are in the upper right. We have come west along West Main Street (formerly Buffalo Street) and are turning on to South Fitzhugh Street. Note the buildings and their relationship to each other. Also notice, that although it hasn't been mentioned, we are walking toward the Erie Canal which is a short block away. 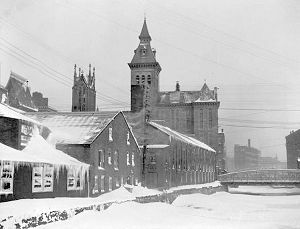 The Erie Canal ran through downtown Rochester from 1825 to 1919. 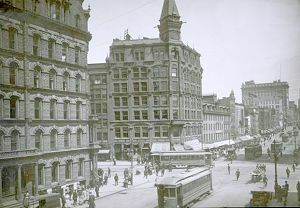 In the 1920's it was converted for use as a subway and Broad Street built over it. As you walk along Broad Street an abandoned subway bed is a few feet beneath your feet. 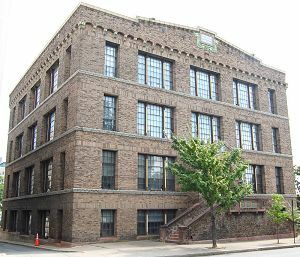 The next building of interest to us is the former Rochester Free Academy at 13 S. Fitzhugh Street. The building was constructed in 1872 - 1873 and was the fourth school building on the site. It would serve as Rochester's City High School for 30 years. 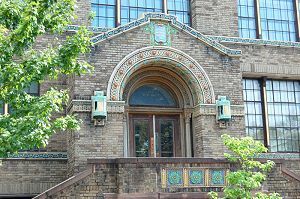 It was named the Municipal Court and Education Building in 1904. It served as the offices of the Board of Education from 1926 to 1979. In 1981 it was restored as office space and renamed The Academy Building. The original architect was Andrew J. Warner. It represents the latter phase of the Gothic Revival style of 19th century. Notice the elaborate windows and arches, floral-incised panels and delicately carved colonnettes. At 17 S. Fitzhurh Street is the Church of St. Luke & St. Simon Cyrene. St. Luke's Church Genesee Falls was founded in 1817, the first Episcopal Church and second church of any kind in the new settlement of Rochesterville. The first building on this site was a modest wooden structure. As the need for space grew the wooden structure was moved to the back of the lot and the present stone building erected. 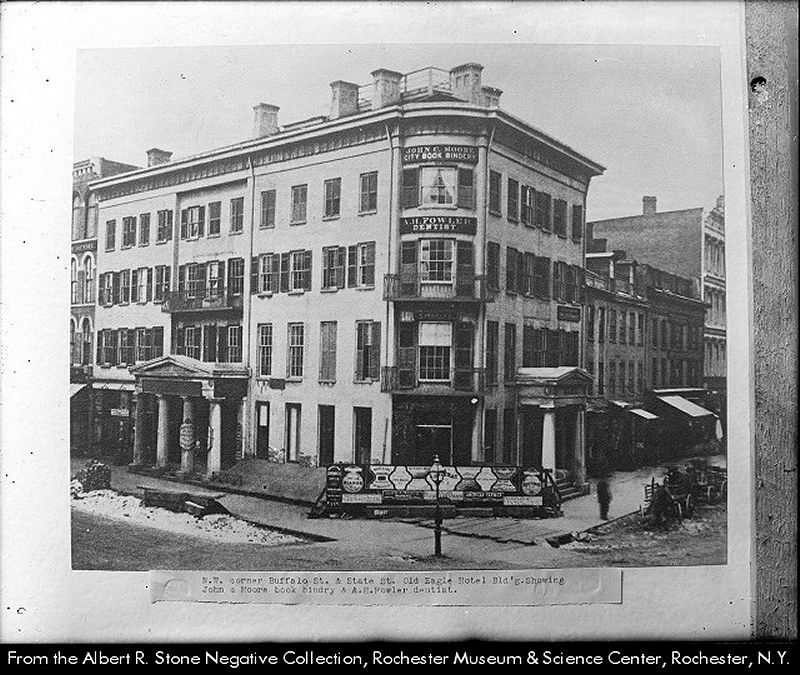 The cornerstone was laid in 1824 for what is now the oldest public building still in use in Rochester. As you look around the interior ask yourself, what is real. The "three decker pulpit", one of only about a dozen remaining on the east coast of the United States, was completed in 1839. The Altar is on the first level, the second is a reading desk from which the lessons would have been read, and the third level is the pulpit. This is the church attended by Nathaniel Rochester. 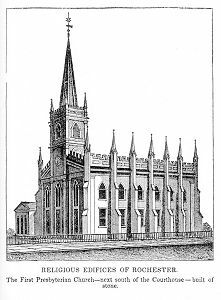 Its design is an example of early of 19th century Gothic Revival style. The building across the street is the old City Hall. The first building on this site was the First Presbyterian Church. This was the oldest religious society in Rochester having organized in August, 1815. They first occupied a wooden structure on what is now State Street. By 1825 they occupied the stone structure show below. The following is an illustration from Henry O'Reilly's 1839 book, Sketches of Rochester. 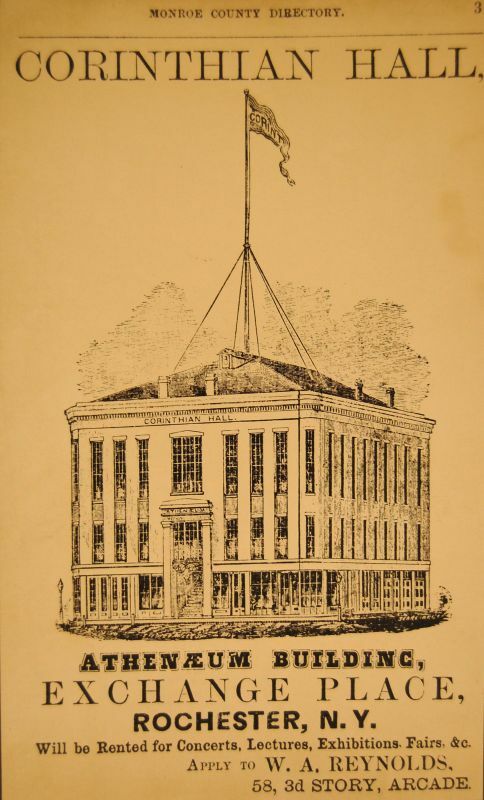 The following is taken from Rochester's City Halls by Joseph W. Barnes, Rochester History , Vol. XI, No. 2, April, 1978. The complete text can be found here. The city used a small space in the first Monroe County Court House to conduct its business. Needing more space the city supported an 1841 plan to build a new court house but the plan was voted down. In 1846 the city rented two floors in Everard Peck's Block for use as a city hall. 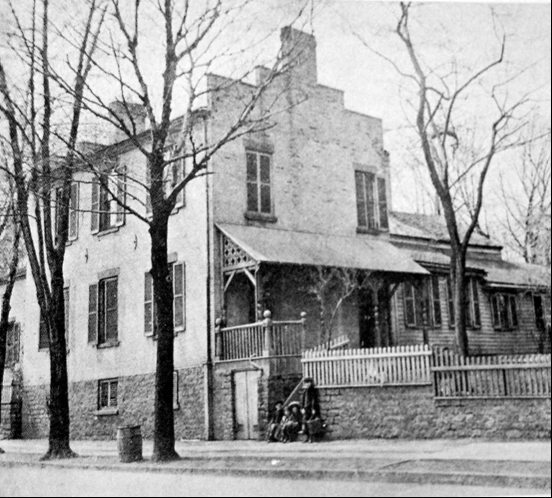 The second court house was built in 1850 - 1851. The city paid about 2/3 of the $63,000 cost and occupied the east side of the building with the county being on the west side. This second court house was twice as big as the first. Each entity was responsible for furnishing and maintaining its half of the building and the county could after due notice buy out the city. As the city continued to grow more space was needed. 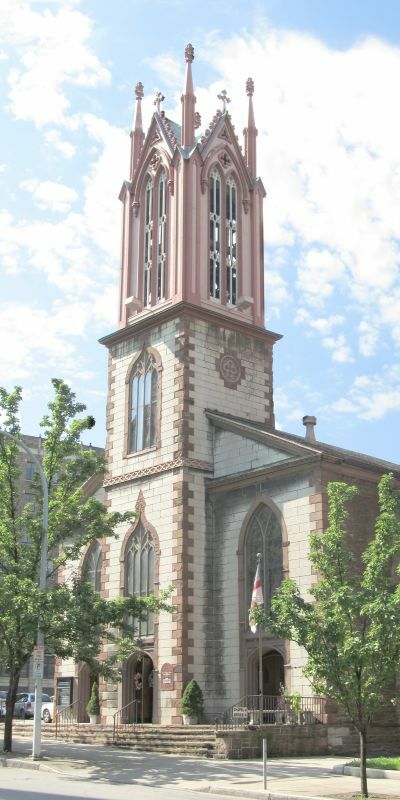 "In 1869, an opportunity arose to buy the property of the First Presbyterian Church located behind the court house. The old stone church, built in 1825, was already structurally unsafe when fire destroyed its steeple. Rather than rebuild, the congregation determined to move elsewhere and a bargain was struck with the common council to sell the lot for $25,000. The supervisors, who had been considering the construction of annex on Fitzhugh Street and Irving Place to accommodate certain county offices, were now persuaded to buy out the city's section of the court house instead. 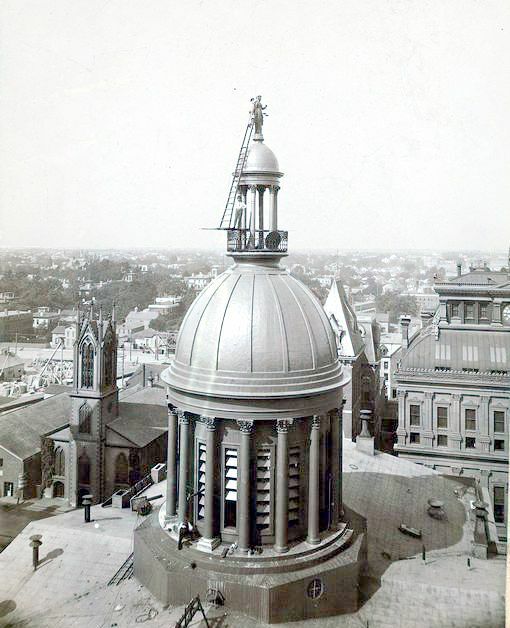 The agreement, negotiated in 1870, called for a payment of $55,000, stipulated that the city should retain its bell, and allowed for two years for the city to vacate the court house. However, four years passed before the city completed its new city hall." 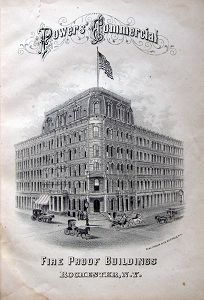 The architect was Andrew J. Warner and the cornerstone laying, on May, 1873, was accompanied by a lengthy parade, speeches and an elaborate Masonic ceremony. The completed building was opened to the public on January 4, 1875. The building had four floors with the top floor being a large hall, with a capacity of 3,000 persons. In the 1940's this amphitheater was converted into two floors of office space. 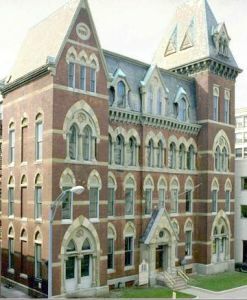 The building represents a transition between the Ruskinesque Gothic and the rounded neo-Romanesque buildings of the 1880's. The exterior is rough grey sandstone. 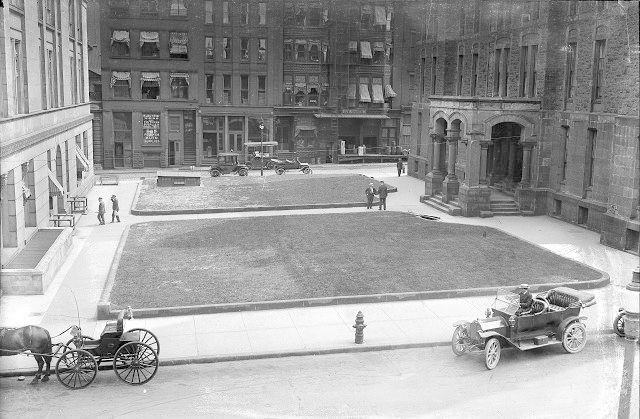 The following picture shows the open space between the court house and city hall in 1915. At one time this open area was a small park. City hall is on the right. In 1926 a low annex to the court house was built on the space. A new entrance was built on the opposite, south, side of city hall in the 1920's and 1930's. The following pictures show the north side of City Hall in 1912 and the second shows it looking from the west along the canal in the early 1900's. 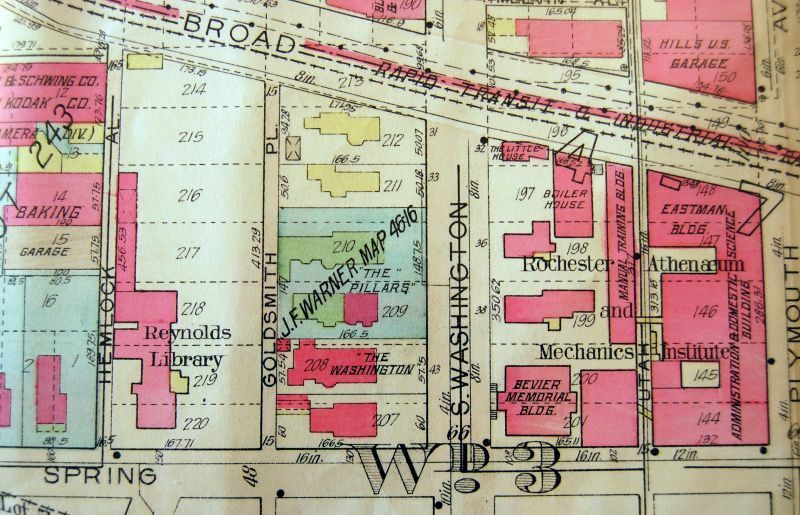 Turning right (west) on Broad will take us to the former campus of the Rochester Athenaeum and Mechanics Institute. 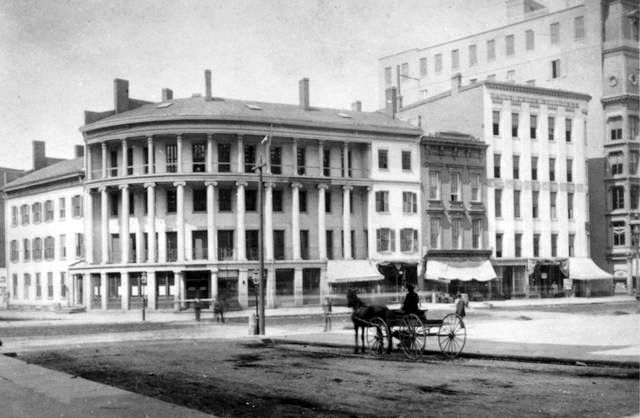 The Athenaeum was founded at a meeting in the Reynolds Arcade on June 12, 1829. Nathaniel Rochester was its first president. Initially the organization was largely a library with many books, newspapers and magazines available to its members. Like most organizations it had its ups and downs but it survived by absorbing or merging with competing institutions. Its golden period was from 1849 to 1871 when it occupied the Athenaeum Building built for it by William Reynolds, son of Abelard. This building was behind the Reynolds Arcade and its lower floor was occupied by an 1100 seat hall, Corinthian Hall. For a quarter century this hall was a major feature of the cities social and intellectual life. Many lectures, demonstrations and cultural events were held there. Speakers included Oliver Wendell Holmes, Ralph Waldo Emerson and Horace Greely. Jenny Lind sold out two shows in July, 1851. Three meetings were held there to test the Fox sisters claim that they communicated with the dead. Other events featured Frederick Douglass and Susan B. Anthony. During this period the Athenaeum was a prestigious organization. 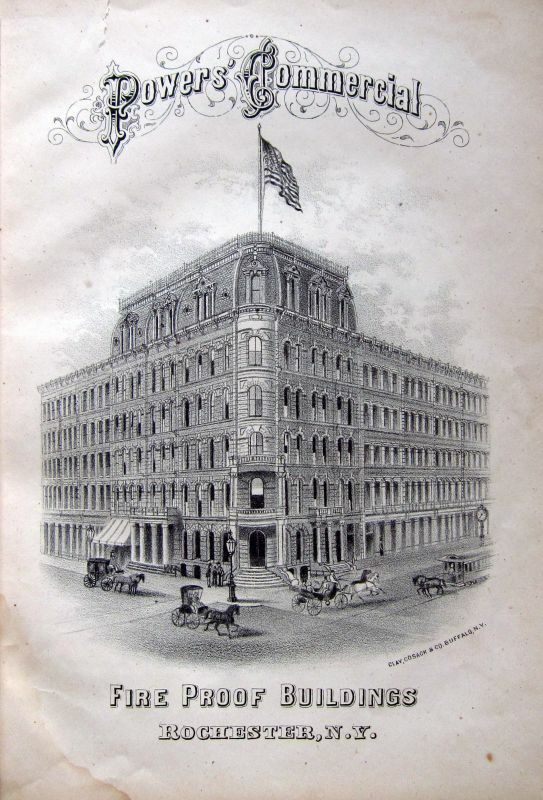 The local economy was depressed after the Civil War and William A. Reynolds had to sell the Athenaeum Building. The Athenaeum had a lease until 1871 so it had time to plan its move. 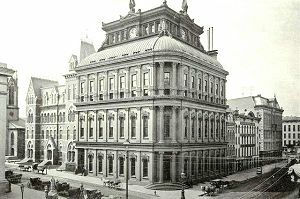 The Academy of Music moved into the Athenaeum Building and the Athenaeum moved into the Rochester Savings Bank rent free. After the move things changed and instead of a vibrant institution the Athenaeum became an upstairs library outside the mainstream of cultural life. In 1876 it was evicted from the bank building and in 1877 sold its book to pay creditors. From this point on it existed mainly in name only although it still had about $3000 in cash and securities held by the Rochester Savings Bank. In 1885 Bausch and Lomb were having a problem finding skilled workers for their plants. They concluded the training school students received was inadequate. 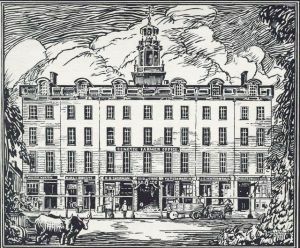 Henry Lomb teamed with Max Lowenthal, a local manufacturer of knitted goods, and endorsed by over fifty local industries, formed the Mechanics Institute. The goal was to train students to use tools but not necessarily teach them a vocation. The first year classes were conducted in the gymnasium of the former Rochester Free Academy building. 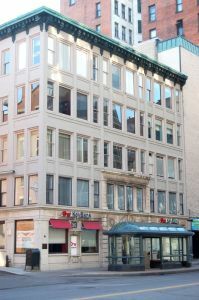 This proved inadequate so the Institute moved to the Smith and Perkins Building at 13 Exchange Street the next year. In 1891possibly looking for prestige and money it was suggested the Mechanics Institute merge with the Rochester Athenaeum. 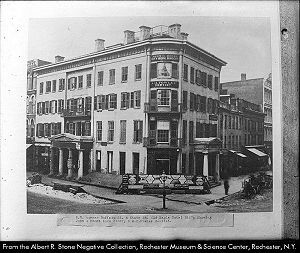 The merger was agreed to and The Rochester Athenaeum and Mechanics Institute came into existence on May 30, 1891. 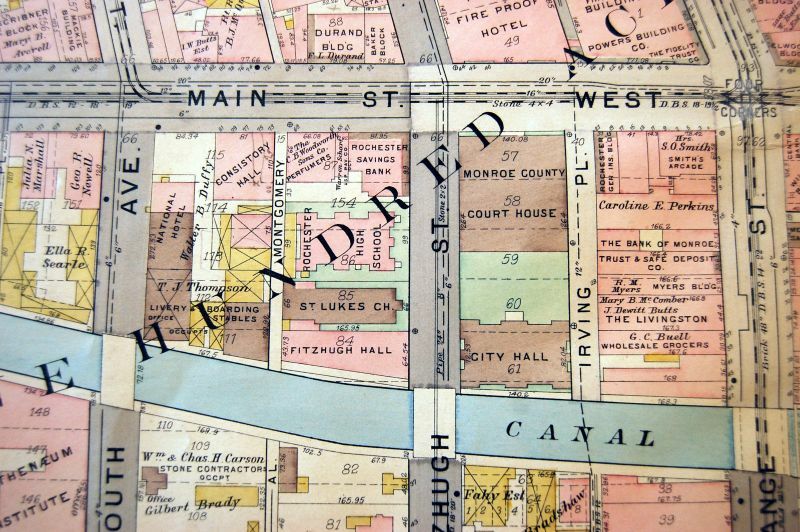 Later in 1891 it was decided to build a campus and land between Spring Street and the canal in the vicinity of Washington Street and Plymouth Avenue was purchased. The first building was constructed in 1894. The area is shown in the 1926 map above. Over the years the Institute changed and it was felt the name no longer represented the range of studies available. The name was changed to the Rochester Institute of Technology in 1944. The decades after the Second World War, RIT experienced a boom in enrollment. By the late 1950's it was in need of space for academic buildings, dorms and parking. In the downtown area space was in short supply, land was expensive and the difficulties were compounded when the state announced it was going to build an expressway through the campus. On November 20, 1961 the Board voted to move the campus to Henrietta. The first classes on the Henrietta campus were held in September, 1968. Walking south on South Washington Street on the right is the the Jonathan Child House. 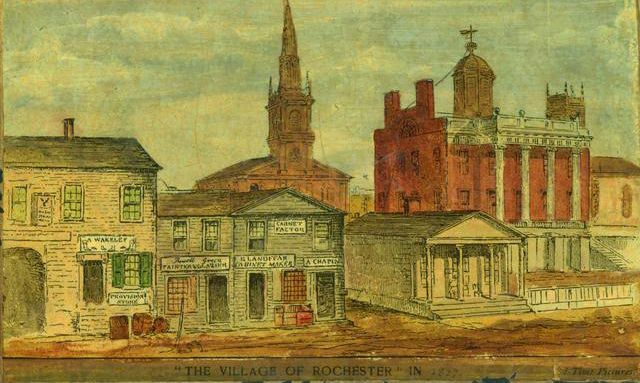 Rochester became a city in 1834 and Jonathan Child, Nathaniel Rochester's son-in-law, became the first mayor. At that time the mayor's term was one year but Child resigned early. A temperance supporter he felt the Common Council was allowing too many stores to sell liquor. The house was completed in 1837 and with its five Corinthian columns is the best example of Greek Revival architecture in Rochester. 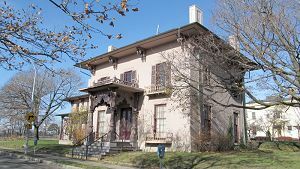 Next to the Child House is the Brewster-Burke House an example of the mid 19th century transition from the classical to the romantic style of architecture. 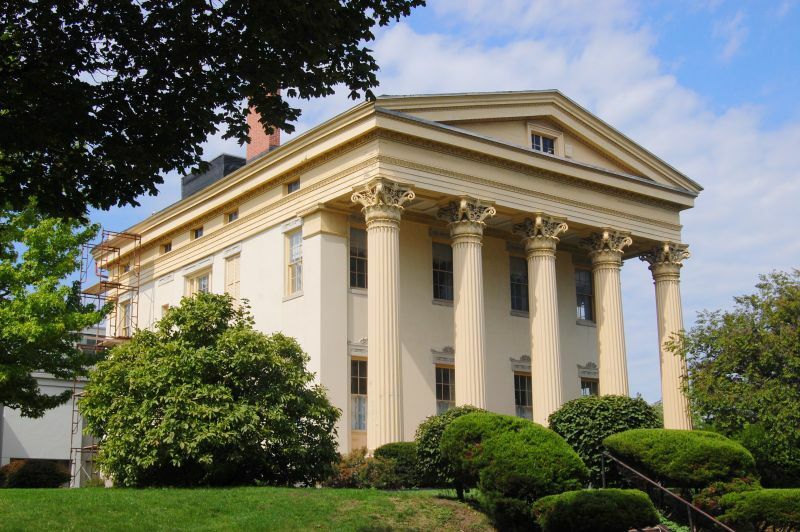 It was built for Rochester insurance agent Henry R. Brewster in 1849 and acquired by the William Burke family in 1866 who occupied it until the early 1900's. When the area was the RIT campus it housed the Graphics Arts School. 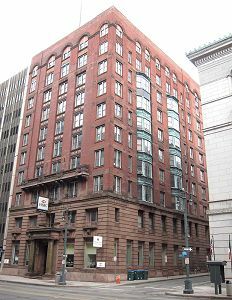 On the opposite side of S. Washington Street is the Bevier Building. The following, along with the information on the Athenaeum and Mechanics Institute, is from Rochester Institute of Technology by Dane R. Gordon, RIT Press. "A few months after the opening of the Eastman Building, the papers announced another even more generous gift. It was from Mrs. Susan Bevier of New York City, whose husband had been a prominent stockholder in the Gordon Hathaway Brewing Company. After his death she often spent summers with friends on South Washington Street in Rochester where she came to know the art students and faculty of the Mechanics Institute. An avid art collector, Mrs. Bevier was extremely interested in art education. Several years before her death she decided to leave her estate to the Institute and in fact gave outright stock valued at seventy thousand dollars along with her art collection, among other gifts. Only when she died was the extent of her bequest known, an estimated $300,000. The major part she designated for a memorial building with a gallery, classrooms, workshops, and an auditorium. One room was to be set aside as a memorial to her daughter Alice." 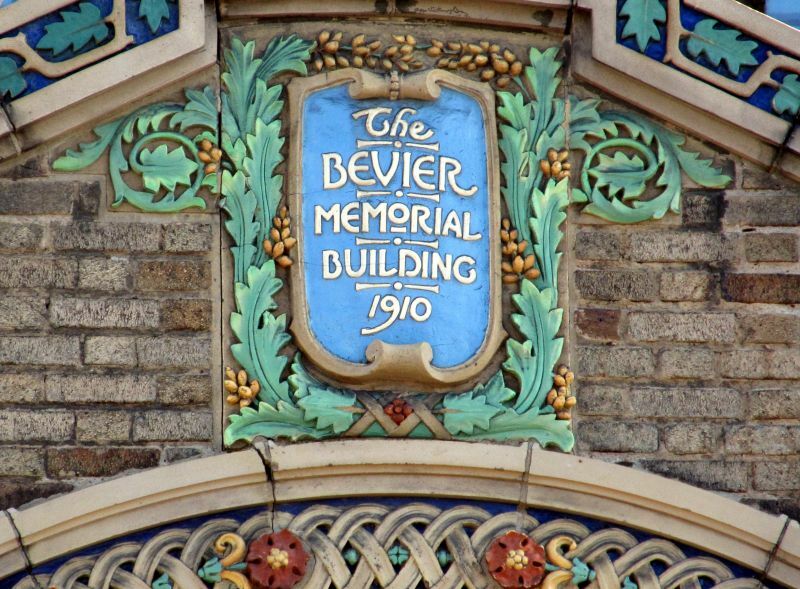 The Bevier Memorial Building dates to 1910 and was built on the site of Nathaniel Rochester's House and features colorful ceramic decoration. The architect was Claude Bragdon. 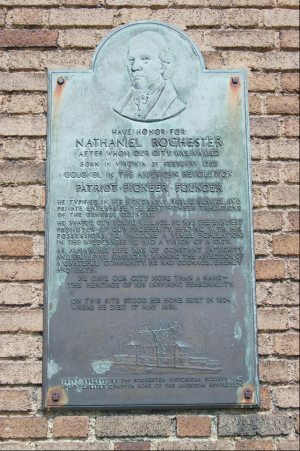 The Bevier Building occupies the site of Nathaniel Rochester's second house in Rochester. This ends our walk. The Landmark Society of Western has some self-guided tours on their website.